This is so cool. In a wonderful compliment to the fascinating sublimation of ice off our deck that I wrote about last week, yesterday we were treated to the other side of that coin, so to speak: deposition. 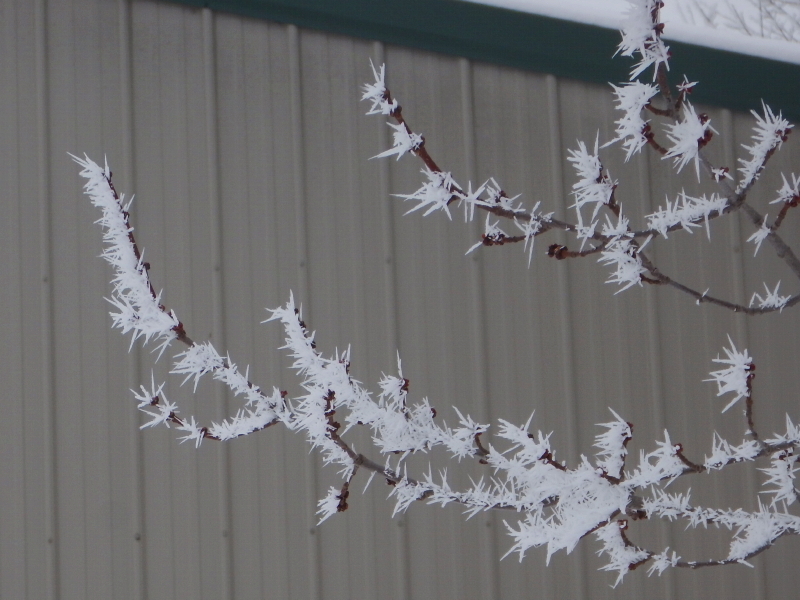 The air is loaded with moisture this week, and we are experiencing some gorgeous hoar-frost. The scenery on my drive home from work yesterday just kept getting more and more spectacular as I approached our ranch. Views of the hillsides covered with flocked trees across the landscape are absolutely intoxicating. The first time I saw a Christmas tree flocked completely white when I was a kid, I thought it looked ridiculous. I couldn’t fathom why anyone would want such a bizarre looking tree. In time, I came to recognize the artificial trees were mimicking the inspiring look of hoar-frost. Now I understand, sort of. 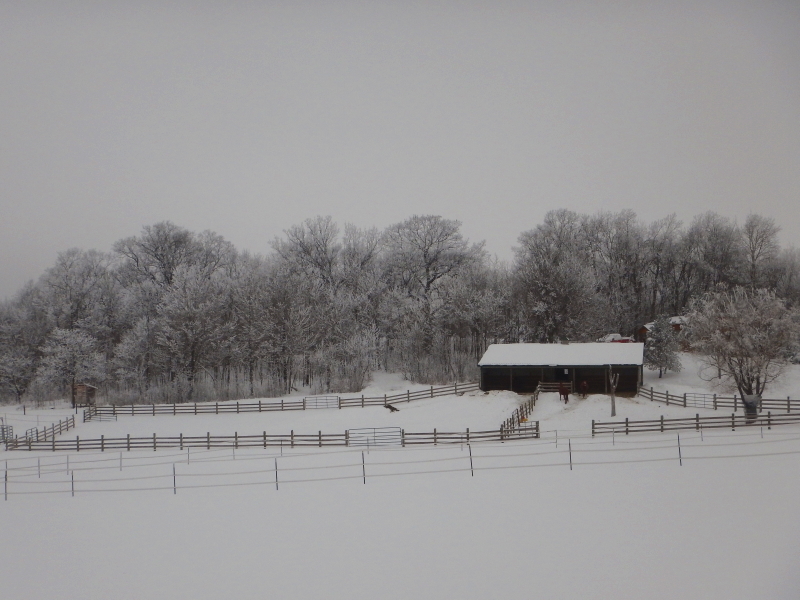 While out walking to a high spot in the hay-field with Delilah to take pictures of the barn with the flocked trees as a backdrop, I received a vivid demonstration of how much our darling Belgian Tervuren enjoys snow. 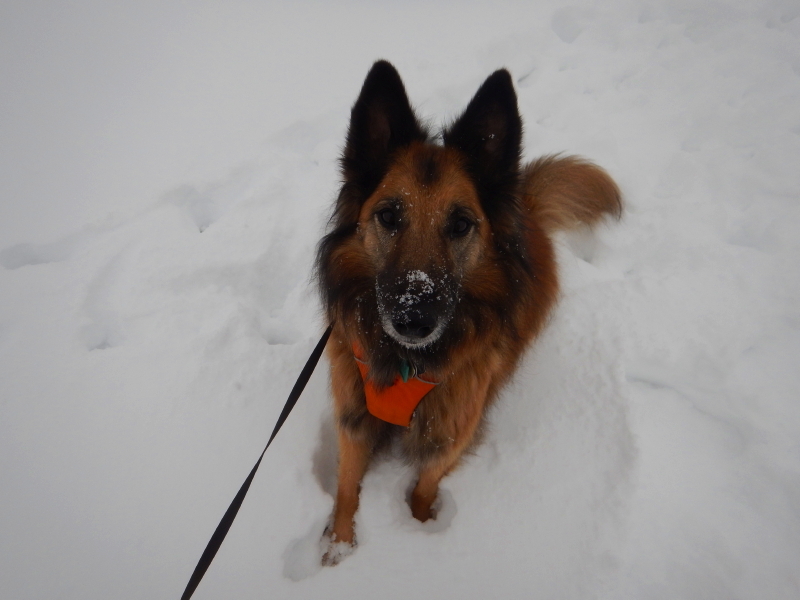 In a blink, she appeared to regress back to a puppy and romped in the deep powder with reckless abandon. It is rewarding to see her so happy, as she has suffered a bit of neglect in the last few weeks, between Cyndie’s illness and the sudden death of Legacy. She has been very patient and a wonderful companion during this time, which leads us to want to reward her with opportunities to play and be the center of our attention again. It’s another kind of science. Animal love. Letting a dog thrive at doing what dogs love to do with the people who take care of them. Getting to do it in a natural wonderland of spectacular frosted trees is a bonus!